Beth Kudlicki and I have been blessed to have lived in Buff, Smith & Hensman’s Dorsey House in Playa del Rey since 2000. The house was completed in 1983 and received a Pasadena-Foothill Chapter AIA Award of Merit Award in 1984. We never tire of living in this wonderful house as we continue to enjoy fresh nuances which the change of the seasons and weather bring to the lighting patterns and shadows in the house interiors. We did not know that much about the firm when we bought the house, only that we immediately knew we wanted to move in. I soon thereafter began to collect material on Southern California’s modernist architectural history. I quickly learned the importance of the Buff & Hensman legacy while researching a book on Julius Shulman’s cover photos which inspired me to compile a bibliography of the firm’s published work. 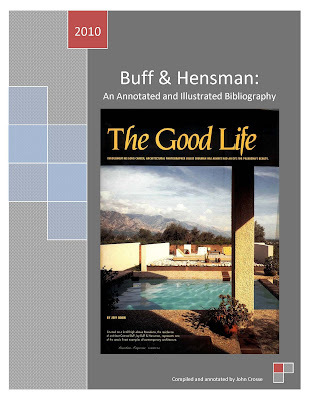 A logical starting point for me was to perform Buff & Hensman; Buff, Straub & Hensman; and Buff, Smith & Hensman searches in my 8,000 item “Julius Shulman Annotated Bibliography.” The search resulted in 250 articles with Shulman photos of Buff & Hensman projects. Shulman has logged close to 50 assignments on Buff & Hensman projects over the years for various clients ranging from the architects to book and article authors, magazine editors, newspaper reporters, exhibition curators, homeowners and realtors. He also used his considerable marketing skills and contacts with publishers and editors to help spread the gospel of modernism according to Buff & Hensman to a global audience. Building upon my Shulman listings, exhaustive searches were also done in the Buff & Hensman archives courtesy of Dennis Smith, on ProQuest, Los Angeles Times Historical, RIBA, Avery, WorldCat, WilsonWeb, Art Index, Google and many other databases and sources resulting in well over 450 items discovered to date. I am also in the process of compiling a Buff & Hensman Project Database which will list all of the firm’s projects, built or unbuilt, by year and job address. I hope that this effort will then make it easier for Buff & Hensman fans to find the still-existant work and foster future preservation efforts of same. My starting point for this effort was the “Chronology of Projects” compiled by James Steele and Alex Moseley included in the back of Buff & Hensman by Donald C. Hensman and edited by James Steele with introduction by Alex Moseley. To complete the work I am in the process of doing a tube-by-tube search of the plans in the Buff, Smith & Hensman office to locate the individual project addresses. Once that effort is finished, I plan to merge that information into this bibliography chronologically by year as described below. Entries in the bibliography are chronological with divisions by year followed by a list of the year’s projects (when the above-mentioned database is complete) and finally, annotated bibliographical items published during the year. I have also included thumbnail images of the covers featuring the firm’s work. I have not taken the time to edit items from the Shulman bibliography that contain work by others in addition to Buff & Hensman. Readers may find it interesting, however, to see what company the firm was keeping in these group articles. Illustrations are from my personal collection, the firm’s archive, or from various internet sources and credited in the adjacent bibliography listing. I would like to thank Dennis Smith who has allowed me unfettered access to the firm’s archives in Pasadena and Don Hensman’s nephew Mark Troughber for sharing his extensive collection.